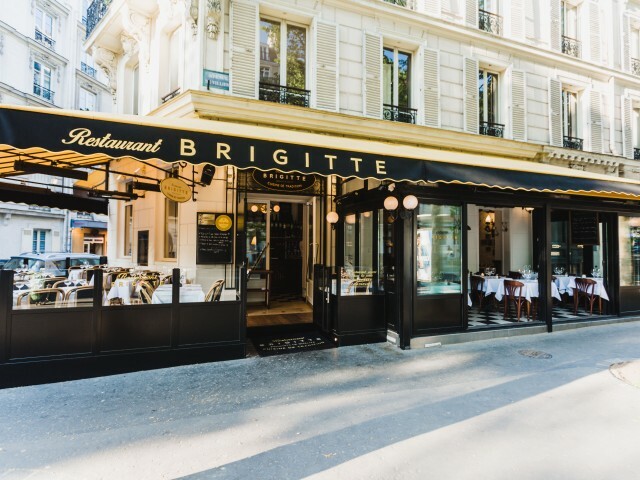 Brigitte does not deny its origins with its authentic setting, its wooden counter and marble, ancient ceilings, family photos quaint, the antiques flea, white glaze and comely terrace. With 30 years of existence, one can almost speak of institution! The welcome is warm and full of energy there. Located 16 avenue de Villiers, the "Brigitte" restaurant will seduce customers busy lunchtime, but also families in the evening. It fits into the dynamic is the seventeenth arrondissement, close to the Batignolles and Parc Monceau. Its name is a respectful tribute to the mother of one of the partners of this institution. The restaurant has 50 seats throughout the year, and thirty more on the terrace in fine weather. The midday menu at 29 €, presented the slate includes the choice of two starters, two main dishes and two desserts. On the map, it takes between € 40 and € 60. Market cuisine, traditional with a touch of modernity. This Kitchen production house, is the only one we never get tired! Good products and tastes francs the beefsteak tomatoes, aubergine and burrata warm pesto sauce, avocado tartare with crab meat and mayonnaise with coriander, or the artichoke mimosa announce entries. The lamb chops roasted with fresh cheese and fresh mint, crispy sweetbread of veal with fresh chanterelle mushrooms, or chicken supreme stuffed with basil Reveal dishes. To complement these flavors, fresh green beans, mashed house or macaroni gratin accompanying dishes. Suggestions and fish of the day will also allow you to mix pleasure and are available in number every day in addition to the card. Finally, a waffle with Mr. Paul, a dark chocolate Valrhona soufflé or fresh pineapple tartare with us sorbet desserts. Two associates for a name. Tanguy Le Gall is 46 years old. He made ​​his debut in fine cuisine in Lille, under the rule of Ghislaine Arabian. Chez Philippe Groult, the Amphyclès Avenue des Ternes, he observes respect for the product and cultivates a taste for quality. He teaches master recipes, the accuracy of the cooking and the refinement of sauces. At Auberge Bressane, with Dumant brothers, avenue de la Motte Piquet, he developed during five years as chief, a taste for traditional cuisine and receives at the time of graduation "Disciple of Auguste Escoffier" . Charles Henry Fish is 42 years old. flat or subtle sauces. Great lover of wines, it is, in his role as butler and waiter, menu combines fine wines and small wineries with excellent value for money.